For a Marasmius, this species is uncharacteristically large, with a cap that reaches 7 cm across and a stem that can be as long as 9 cm. 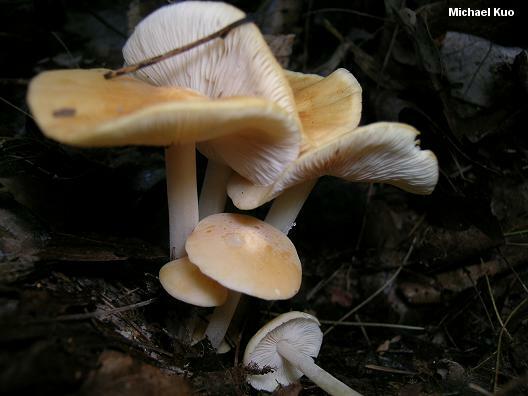 Vaguely reminiscent of Marasmius oreades, which grows in fairy rings on lawns, Marasmius strictipes grows in hardwood forests in eastern North America. While it occasionally grows in clusters it is more likely to grow alone or with a few others nearby. The long, straight stem and the large, yellow cap (which is usually not bell-shaped and which begins to curl upwards with maturity) are good field characters for this species; microscopic examination can confirm identification. Collybia strictipes is a former name. 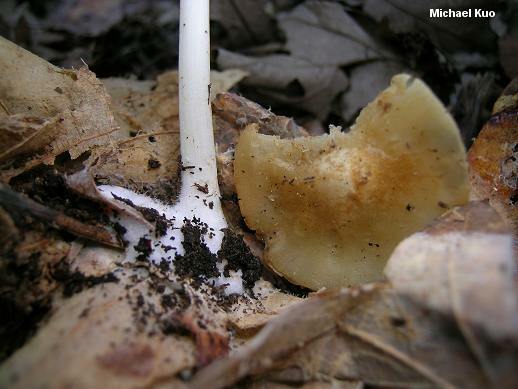 Ecology: Saprobic on leaf litter in hardwood forests; growing alone or gregariously, occasionally in clusters; summer and fall; east of the Mississippi River. 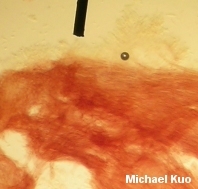 Cap: 3-7 cm across; convex, becoming flat; dry; the margin becoming uplifted; typically bald overall and faintly lined at the margin; becoming a little wrinkled over the center; moist; yellow to orangish yellow or yellowish; fading markedly as it dries out (often resulting in a patchy, two-toned appearance). 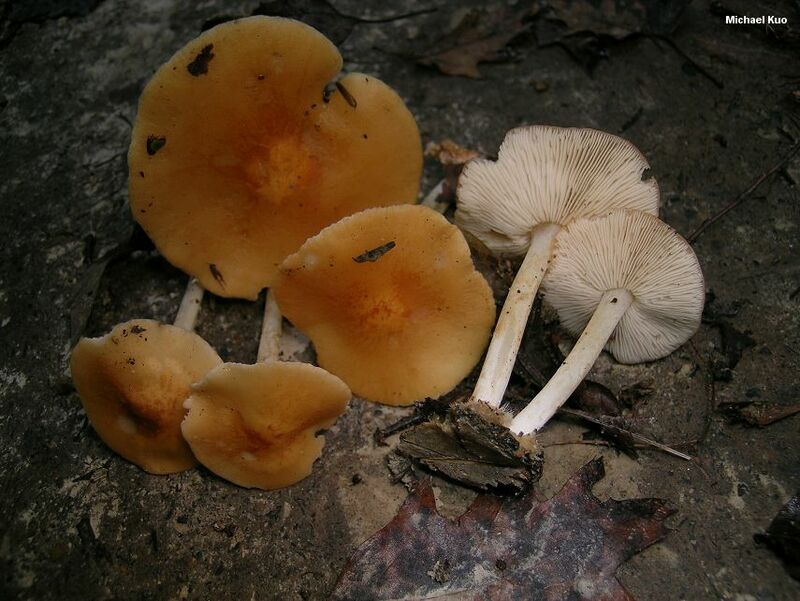 Gills: Attached to the stem or nearly free from it; close or crowded; whitish, pale yellow, or orangish yellow. Stem: 3-9 cm long; up to 1 cm thick; equal; dry; straight; tough; sometimes with a faint bloom or dusting; with copious white basal mycelium; whitish or pale yellow. Odor and Taste: Taste mild or slightly radishlike; odor not distinctive. 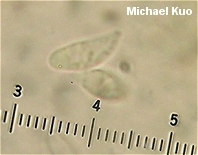 Microscopic Features: Spores 6-10.5 x 3-4.5 µ; smooth; long-elliptical or with one end subfusiform; inamyloid. 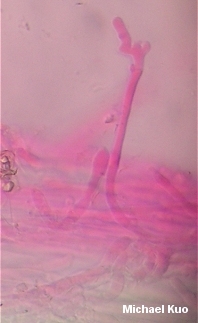 Pleurocystidia absent. 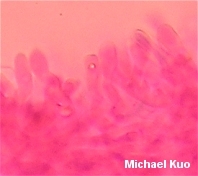 Cheilocystidia abundant but short; 14-35 x 4-9 µ; irregularly clavate to cylindric or subfusiform. Trama dextrinoid. Pileipellis hymeniform. 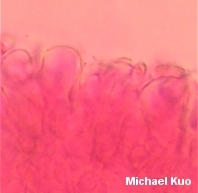 Caulocystidia present; variously shaped (cylindric, subfusiform, subclavate, slightly lobed); 4-7 µ wide. REFERENCES: (Peck, 1888) Singer, 1943. (Saccardo, 1891; Kauffman, 1918; Coker & Beardslee, 1921 [as Collybia nummularia]; Gilliam, 1976; Smith, Smith & Weber, 1979; Halling, 1983; Phillips, 1991/2005; Lincoff, 1992; McNeil, 2006.) Herb. Kuo 10029605, 09190604, 09241102.